The ProxKey is a proximity key-fob offering HID proximity technology in a convenient, pocket-sized device. It easily attaches to a key ring, badge clip or lanyard. The ProxKey is suited for use in access control applications where a Photo ID is not required. 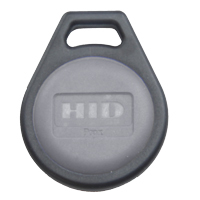 HID Global have now introduced the ProxKey III - a new updated version of their well-known proximity keyfob. This version will be supplied for all orders with immediate effect.